Summary: Seconds before the Earth is demolished to make way for a galactic freeway, Arthur Dent is plucked off the planet by his friend Ford Prefect, a researcher for the revised edition of The Hitchhiker’s Guide to the Galaxy who, for the last fifteen years, has been posing as an out-of-work actor. This book is ridiculous and random and makes very little sense, but it is fantastic. Any book that has quotes like “Curiously enough, the only thing that went through the mind of the bowl of petunias as it fell was Oh no, not again,” must be hilarious. When reading this book, you have to put all thoughts of normalcy aside. It is a wild ride of random events that make little sense and hilarious characters, including a depressed robot named Marvin. Arthur is a little annoying at the beginning, but he gets better. Ford is just great. Trillian was meh and Zaphod was idiotic. Marvin was my favourite character. He causes a ship to become depressed and commit suicide. How could you not love him? The story makes no sense. Stop trying to make sense of nonsense and just enjoy the bloody thing. Think along the lines of Alice in Wonderland, but in space with less math and more bad Vogon poetry. You will get that joke once you read both of those books. If you are looking for something meaningful, emotional, and deep, look elsewhere because you will find none of that here. It is a required taste so do tread carefully. I loved the book because I went in knowing that it would be random and ridiculous story. You have been warned. Oh, the ending was great. Unexpected and fantastically hilarious. 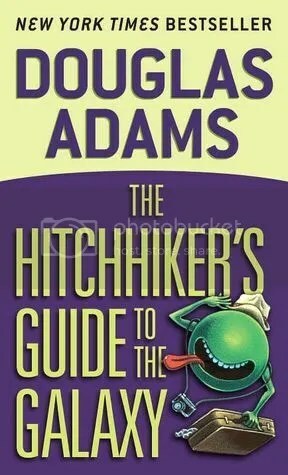 This entry was posted in 2013, Reviews and tagged Book Blog, book review, Classic, Douglas Adams, Dreaming With Ink, Hitchhiker’s Guide to the Galaxy, Humour, Michelle’s Paper Garden, science fiction by dreamingwithink. Bookmark the permalink.